A former teacher of Charlottesville attack suspect James Alex Fields Jr., says he was mentally disturbed. “He was very infatuated with the Nazis, with Adolf Hitler,”says former teacher Derek Weimer. The 20-year-old man accused of driving his car into a crowd of counter-protesters during a white nationalist rally Charlottesville, Va., had an “infatuation” with Adolf Hitler and Nazis, according to the suspect’s high school history teacher. 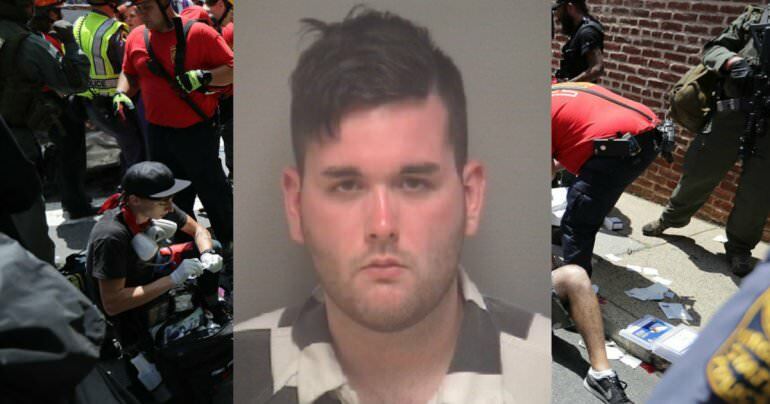 James Alex Fields Jr., 20, was arrested Saturday and charged with second-degree murder after he allegedly slammed his car into a group of people in downtown Charlottesville, killing 32-year-old Heather Heyer and injuring 19 others. Weimer also said that Fields Jr. wanted to go into military service but was rejected on mental health grounds. On Friday night and Saturday white supremacists and racists marched in Charlottesville, Virginia. Hundreds of white supremacists marched and demonstrated against the city’s plan to remove a statue to a Confederate war hero. Also on Friday night and Saturday counter protesters, including Black Lives Matter and Antifa terrrorists, organized marches and demonstrations to oppose the white supremacists. During the white supremacist marches on Friday and Saturday violent Antifa thugs attacked the protesters with mace and projectiles. The antifa thugs ALWAYS resort to violence and have been beating conservatives across the country for several months. The media has mostly ignored these violent leftist attacks. The president condemned violence on all sides during his statement. This was before the killer was identified. The liberal media, Democrats and opportunist and ignorant Republicans condemned the president. What Trump said was completely appropriate. The left was beating heads on Saturday like they always do. The white supremacist allowed his hatred to drive through a crowd and kill a 32 year-old woman. Trump spoke out to unite the country. The left only divides.